 In January 2015, I prayed, believed God and went for a spinal surgery in Abuja, Nigeria and it was successful.  Again in July 2015 I had a successful knee replacement surgery in Abuja, Nigeria. For the bills God provided helpers.  In 2017 my daughter who has been seeking for the fruit of the womb for eight years has been blessed with triplets.  One of the people petitioning God for in respect of the fruit of the womb is currently pregnant. All these and many more has been my prayer points. I sowed the 2017 EVIDENCE POSSESSION SEED (EPS) and received my prophetic prayer psalm (PPP) which I prayed for seven weeks. God is faithful and to him be the glory for the results – (Mrs. G.U.I ogeyiedu@gmail.com) I bless God that he is no respecter of persons. What he has done for one, he can do for another! Whatever are your prayer points in this fasting program, they shall come to pass because I agree with you and command a blessing upon your prayers today. Helpers shall locate you! When you call one person, hundreds and thousands shall answer you! You will meet people that have answers to your questions this year! HARVEST EATERS will run mad! Bad news and misfortune shall pass over your address! The wrong doctor, nurse, pharmacist will not meet you! There shall be no medical mistakes around your life this year! Like Joseph you shall be called a fruitful vine (today’s scripture VS 22)! 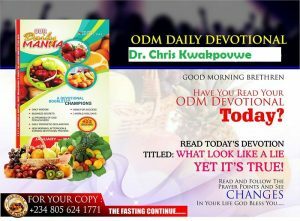 Your testimonies (YOUR HARVEST) shall run over and CANNOT BE WASTED! Always follow prophetic instructions in this commission! Sow your CHANGE OF GARMENT seed, pray your DECORATION PSALM seriously and come with a dress you can afford to tear after prayers to the Tafawa balewa square, Lagos for the world anointing night of January 26th! It is your night! It is your year! Amen! READ Daily Manna 20 November 2018 - MOSES NEVER PLANNED FOR THIS! TODAY IS DAY 14 of this 21 day fasting programme. Turn to page 64 of the “WAR AGAINST HAMAN-13 booklet for today’s special prayers and be at the TBS Lagos on January 26th 7pm till dawn. Bring a dress you can afford to tear during prayers! PRAYER POINTS: Take song 3: Because he lives…. • Every HARVEST EATER or conspiracy against my testimony concerning 2018 ; scatter in Jesus name. I loose testimonies for those doing this 21 day fasting program worldwide! • Pray about today seriously and any other issues as led now.